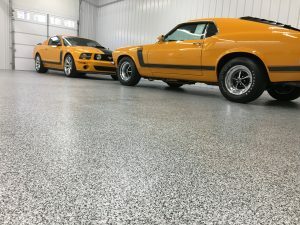 Floor Skinz is an epoxy floor contractor that has been proudly serving the area of Woodstown, NJ since the birth of the company. 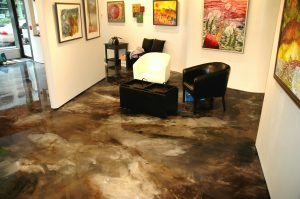 For those of you that do not know what we do, we apply concrete floor coatings to any and all types of concrete floors. The purpose of coating concrete floors is to give them extra durability and strength. We can also make them waterproof, anti-slip, and chip resistant! We offer many different options for our customers to choose from. Below are three pictures of our most popular floor types. Colors and designs can be changed to the customer’s preference! Contact us today for a FREE quote! 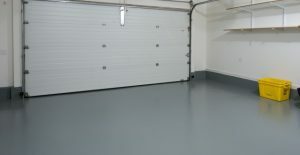 Grey basic epoxy garage floor coating.